America’s most fuel-efficient compact truck has seen its last range - in the U.S., at least. 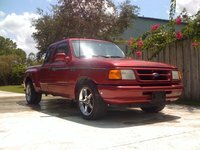 Ford already considered shutting down the Ranger once in 2009, leaving very little room to hope for an updated comeback here in the States. Overseas, however, will be a different story with plenty of enviable features in the new release. Perhaps the puddles of drool will be enough to convince Ford we do want smaller fuel-efficient trucks - we just want them with a few more of the modern conveniences offered in the midsize competition. However, even without a change over last year, the 2011 Ranger remains a perfectly capable little truck for all-day outdoorsy fun, yet sturdy enough that you can take it “home” to the boss, too. Only 3 trim levels made it to the finish line - the XL and XLT, available as a Regular cab or SuperCab, and the Sport, available only as a SuperCab. With a maximum tow capacity just under 6,000 pounds, the 4-liter V6 in the Sport SuperCab, and optional in the XL and XLT SuperCabs, is good for 207 hp and 238 lb-ft of torque. This engine gets 16 mpg city/21 highway with 2-wheel drive or, as is the case for XLT and Sport SuperCabs, somewhere in the 14 - 19 range off-roading in 4WD form, depending on your transmission. The 143-hp 2.3-liter inline-4 enables Regular cabs and baseline SuperCabs to tow about half as much and gets 21/26 with the 5-speed manual or 19/24 with the optional 5-speed automatic transmission. 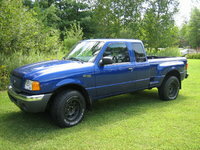 Aside from that the 2011 Ranger looks like a truck from the '90s, rides like a truck from the '90s, and drives like a truck from the '90s - pretty much because it is a truck from the '90s. Sure, the features are up to date with side curtain airbags, antilock brakes, stability and traction control, keyless entry, modern radio options including MP3 functionality and satellite radio, power accessories, air conditioning and a 60/40-split bench seat - and the materials are certainly up to par - but the end result is a far cry from pushing the envelope, with a dated design and rough ride. That said, at least the price is right on, thanks in large part to these minimal changes. 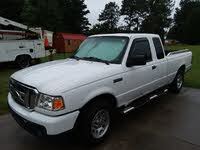 Take it or leave it, because after this you can kiss the Ranger goodbye. 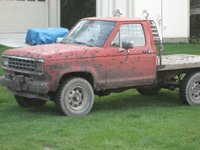 The very first Ranger showed up in the 1960s F-150 pickup line, but it didn’t leave the nest until the 1983 models went on the market in '82 - at first only with 2-wheel drive, with a 4-wheel-drive (4WD) version available a few months later. 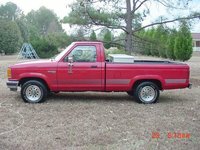 Sporting an 80-hp 2.3-liter inline-4 with your choice of a 4- or 5-speed manual or 3-speed automatic, and a 6-foot or 7-foot bed, this Ranger was roomier than its competition with better utility. That utility was greatly expanded once a 115-hp 2.8-liter V6 joined the lineup by the end of that year, boosting tow capacities to 1,600 lbs and making for a total of 4 first-year trim levels - base, XL, XLS, and XLT. 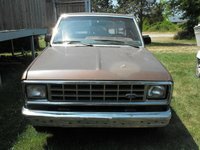 For 1985 Ford updated the Ranger’s transmissions and tweaked the little engine for 10 more hp. An STX trim for rougher terrain joined the lineup too, with bigger tires, new paint and bucket seats. 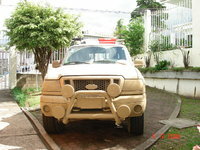 A 1986 overhaul replaced the 2.8-liter engine with a 2.9-liter V6 good for 140 hp, which became the standard in STX Rangers. The SuperCab debuted coupled with a 6-foot bed, technically increasing passenger capacity to 5 with optional jump seats in the extra cab space. “Technically” because you could probably squeeze a 3-piece clown brigade in there, or a few supermodels perhaps - certainly not 3 full-grown American adults - but it is a good size for kids. 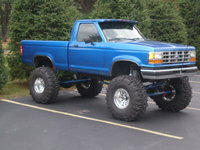 For 1987 Ford upgraded all 4WDs to the 2.9-liter V6, introduced a “High Rider” STX 4WD with a Regular cab and won the top spot with the Ranger as the best-selling compact pickup. Perhaps the fame overinflated Ford’s oval - alongside a few cosmetic changes for 1988, Ford debuted the flashy GT street truck, only to scrap it 2 years later. Back down to Earth, the '89 facelift brought a few interior conveniences and exterior aggression, with a few tweaks to the base engine and rear antilock brakes as a standard feature. With just 2,000 units produced, Ford scrapped the GT and focused on higher pursuits for the 1990 update. SuperCabs gained fuel capacity for a total of 20 gallons, and 4WDs now had the option of a 4-liter 160-hp V6 and 5-speed manual or optional heavy-duty 4-speed automatic transmission. Then came the Sport in 1991, which was basically the GT skin without its meat, and it too would live on for just 2 years. 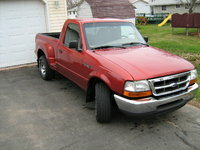 Two-wheelers finally came of age, though, with the same 140 ponies offered in the STX since 1986, but with a 3-liter V6. The 4-liter V6 became an option for even baseline Rangers, and an optional 60/40-split bench made those nuclear missile drills to do anything behind the seat a thing of the past. For the final year of its first generation, Ford revised the Ranger’s new V6 to fix a fuel injection problem, slapped some new stripes on Sport models and fidgeted with a few minor safety features. How dull - but Ford was hard at work on the next generation. The 1993 second-generation overhaul revamped the entire truck, inside and out. In addition, the 2.9-liter V6 was dropped in favor of the 3-liter V6 that stuck around until 2009, and a few other engine specs shifted slightly for the improved driving dynamics. The Splash model debuted later that year, making a total of 5 trims on top of the base XL, XLT, STX, and an XL Sport that would be dropped - like the GT and Sport before it - in just 2 years. 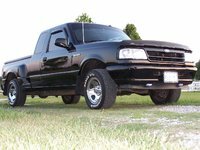 Mazda borrowed the Ranger platform for its own '94 B-Series truck, while Ford just added side door guard beams and a Splash SuperCab. More safety features came in the '95, with ABS and a driver airbag standard for most models, but an off switch for passenger airbags wasn’t added until the following year. A few engine tweaks amped the 2.3-liter engine to 112 hp and the 3-liter to 145. The STX lost its 2-wheel drive option, but SuperCabs could now get a power driver's seat. 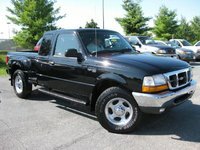 A 5-speed automatic transmission made its debut in '97, affording the best performance and fuel economy to date out of the 4-liter V6, and some of the engine and feature offerings were shuffled around, but nothing new cropped up for this final year of the Ranger’s second generation. The new generation of Ranger pickups grew by about 4 inches with a fresh face inside and out, affording greater comfort and more creature comforts. Driving dynamics were also much improved, the 2.3-liter was scrapped for a 2.5-liter four-banger with 117 hp and reduced emissions, a new Off-Road package offered several upgrades for rough terrain, and a 4-door option for SuperCabs made it somewhat less awkward to hop in the back. For '99, Ford drowned the Splash and resurrected the Sport as an XL Sport and XLT Sport that were essentially the Splash with a new old name. In addition to some cosmetic shuffling on the other trims, the 3-liter could now run on ethanol, gasoline or a combination of the two. A taller truck with big tires and 2-wheel drive called the XL Trailhead joined in the third generation’s final year, along with a few other minor feature changes. The only significant change to start out the fourth and current generation was the switch from an overhead valve 4-liter V6 to an overhead cam 4-liter V6 good for 207 hp. All-wheel ABS became more widely available, new option packs afforded more outdoorsy and luxurious feature sets, and the Edge came on board with either rear-wheel drive or 4WD. The trend continued in the '02 with the addition of a heavy-duty XLT FX4 off-road 4WD and a Tremor SuperCab with high-test audio equipment. 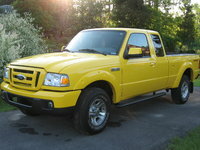 The FX4 gained a tough big brother in the '03 Level II, but until 2009 the Ranger gained only a series of cosmetic and audio upgrades, and many years saw the Ranger carry over without a single significant change. Even worse, the '09 would lose the 3-liter V6, and the 2010 saw significantly fewer options available to the everyday consumer - although stability control, side airbags and a Class III hitch were now standard across the board. The smaller lineup consisted of just the XL, XLT and Sport - and nothing changed for 2011. 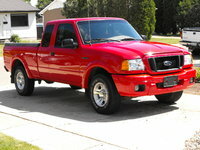 The Ranger's lack of updates has attracted a great deal of criticism, and rather than facing the music, Ford has seemingly opted to let the Ranger run off to greener pastures. 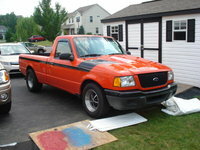 Although nothing is officially confirmed yet, the rumor mill is 2 years old, and at the time Ford said the U.S. Ranger and its Twin Cities plant would close down for 2012. There is a “global” version to continue beyond this point, but Ford has nothing to say about that possibly making its way to U.S. soil. 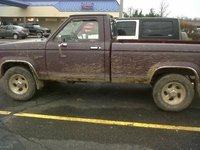 The latest-generation Ranger, most especially 2002 and newer model years, are relatively problem-free if you discount the brakes catching in wet weather, the clutch squeaking from a faulty slave cylinder, front pinion seals leaking and ball joints failing - any of which would cost no more than $250 to fix. 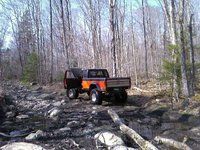 However the ‘03 along with several prior model years have serious issues in the 4WD systems, with repairs ranging in cost from $100 to $1,100. The used prices reflect '02 and newer model years’ relative reliability, with no big bargains in sight until you take a gander at the '07 and '02 SuperCabs. The steep price drop from there is indicative of the quality you should expect. Rangers made from 1997 to 2001 are plagued with so many issues they’re almost not worth buying at all. 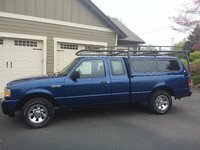 Between sensor issues, corrosion affecting wiring and switches, oil leaks from a defective pan, knocking from various defects, hoses rubbing and other housing defects in the '97 and '98, and so much more plus serious 4WD issues from then to the ‘01 model, you can expect your $2K - $4K bargain truck to spend a good deal of time on the lift. 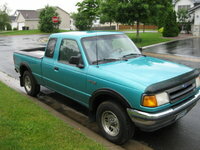 However the '95 and '96 Rangers have just a couple issues with sensors and control valves for a cheap fix and a cheap reliable truck between $1,200 and $2,000. The '96 is the one to get if you intend to use a child seat - these were the first to feature a switch to disable the passenger-side airbag. Any older than the '95 and you start getting into those 4WD and rear ABS issues, plus the need to retrofit the air conditioning in the '93 and older model years for about $200 to $300. 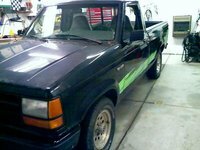 Sure, you can get a '94 or older Ranger for less than $1,500, but is it worth the constant repairs and complete lack of modern features? 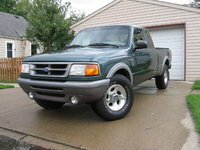 Any older than the '91 and you will have to hunt down an STX or 4WD for a capable engine, although you’re much better off finding a '91 or newer with that 4-liter V6. For less than a grand, it’s a steal if you don’t care for the improved driving dynamics and modern touches of the later generations.